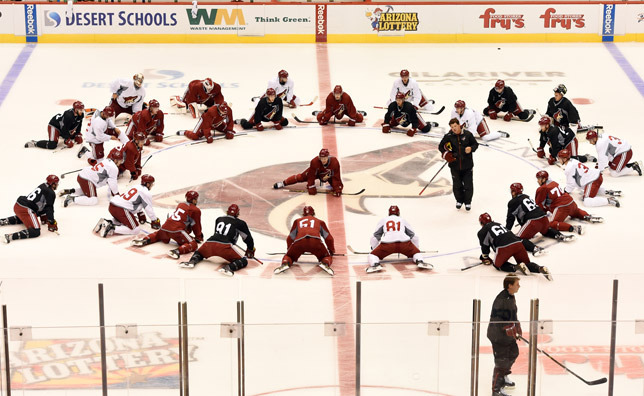 GLENDALE – The Coyotes dropped the puck on the 2014-15 Rookie Camp on Saturday at newly renamed Gila River Arena. Twenty-nine players – three goalies, nine defensemen and 17 forwards – skated for a little more than an hour in front of an enthusiastic group of spectators eager to watch live hockey. The skate was the end of a long day for the players. It began with detailed medical exams and vigorous physical testing before the on-ice workout. All eyes were on Samuelsson and Domi, the recent first-round draft picks who had no trouble producing eye-popping offensive statistics in junior hockey last season. Regarding Domi, Tippett said he’d be watching to see how he performs in all zones of the ice this week before the veterans report to main camp on Thursday. Domi is excited to prove that he has worked on his all-around game. Max Domi. Photo by Norm Hall. Tippett liked what he saw from Samuelsson on the first day of camp. He said he looks more physically mature and focused. He also said it’s easy to see that Samuelsson has been skating with Coyotes veterans on his own the past few weeks. 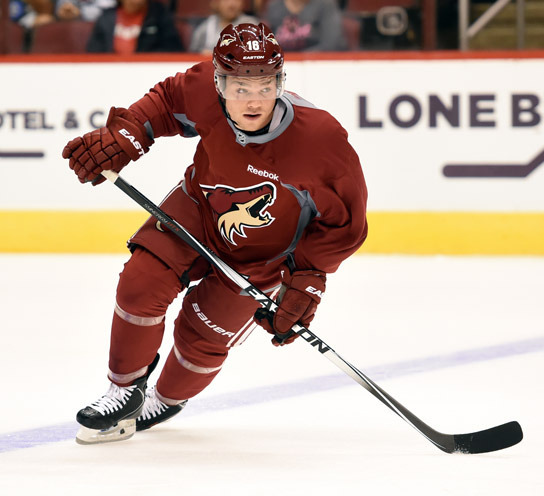 The rookies will practice again on Sunday and Monday starting at 10 a.m. at Gila River Arena. On both days the group will be split into two teams for scrimmages starting at 10:50 a.m.
All practices are open to the public and free.